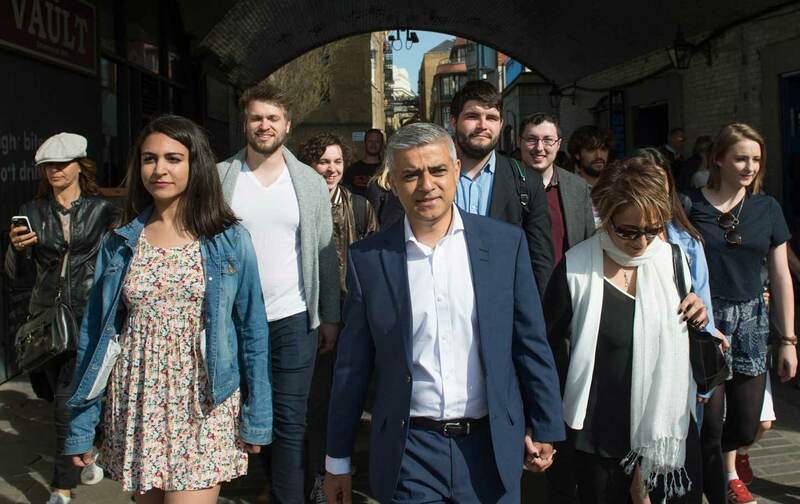 Sadiq Khan overcame the smear campaign leveled against him and Labour colleagues to take back the capital after eight years of Tory rule. Khan’s victory is a huge win for Labour, which took back the capital after eight years of the Conservative Boris Johnson. Yet no sooner was the result announced than the airwaves were filled with Labour MPs complaining that there was “nothing to be cheerful about.” In Scotland, where a revived Tory Party edged Labour into third place in the Scottish Parliament behind the Scottish National Party, there was indeed scant occasion for rejoicing. Not even by the SNP, which, with just under half the vote, will now form a minority government. Labour also lost one seat in the Welsh Assembly, but kept enough to retain control of the government, with the Tories and the Liberal Democrats losing a total of seven seats—which were picked up by the far-right UK Independence Party. But in local council elections across England, the Labour meltdown that journalists and pollsters had been confidently predicting—and preparing to blame on leader Jeremy Corbyn—never happened. Instead, when all the votes are counted Labour will probably end up slightly increasing its share of the vote in England—though it will still be a long way from being able to seriously challenge the Tories for power in Westminster. That election, however, is four years in the future, and the main consequence of yesterday’s vote is that the majority of Labour MPs—who never liked Corbyn in the first place, but have had to pretend to accept him as leader after an overwhelming majority of party members chose him—lost the pretext they were hoping for to stage a coup. That was what was mainly behind the hysterical headlines in the past week charging that Labour—or the left—was in crisis over anti-Semitism. As I’ve written before, Labour is in crisis. And there is certainly anti-Semitism in Britain—including on the left. But the attempt to link the two was for the most part a cynical campaign aimed at discrediting Corbyn (a longtime stalwart of the Palestinian cause). That it also played right into the hands of a despicable Tory campaign to depict Sadiq Khan—a Muslim who voted in favor of gay marriage, and who said he wanted to be “the most pro-business mayor” London has ever had—as a dangerous radical deterred them not at all. For today, it is enough to say that in 21st-century Britain, the son of a bus driver has beaten the son of a billionaire. And that Londoners—facing a fear campaign depicting Muslims as un-British and Labour as untrustworthy, and a barrage of poisonous rhetoric seeking to pit Sikh against Hindu, Jew against Muslim, and native-born Britons against immigrants—have risen to the occasion and defied the hatemongers. Something for Americans to think about between now and November.